The NexHT Fitness Vibration Platform is a compact vibration machine made by Inland Products Incorporated, a California based company that wants you to have a California summer body, no matter where you live. Vibration machines are designed to give you a short, efficient workout that blasts fast and improves muscle tone. The vibrations force your muscles to work more than they do on stable ground, so you do not need to spend as much time working out. If you are ready to take the plunge and enter the world of vibration machines, here are some reasons why the NexHT Fitness Vibration Platform is a great investment. 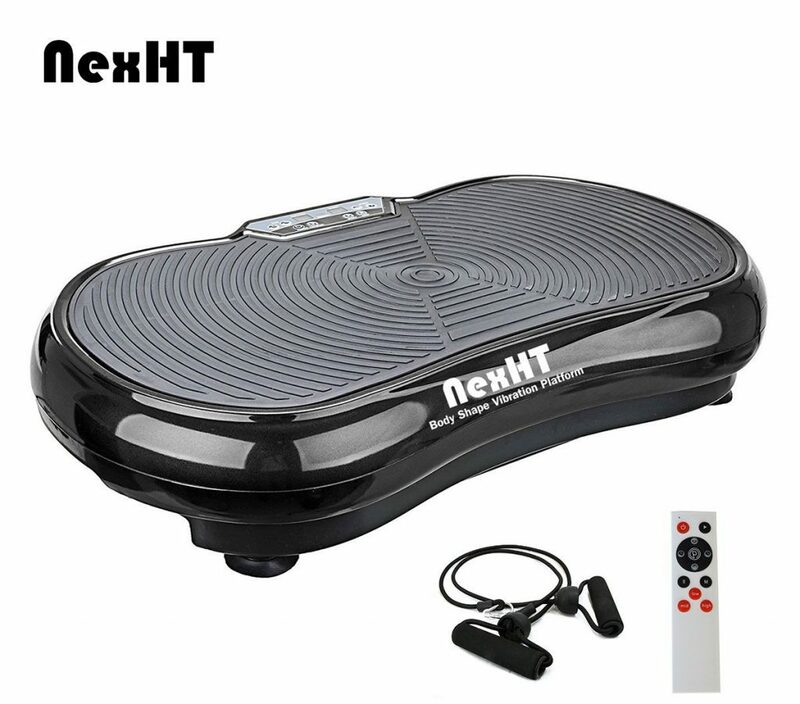 The NexHT Fitness Vibration Platform weighs only 30.5 pounds and is about 26 inches wide. There is no stand or handle, so it is very easy to carry and store. Despite being light weight, it can hold up to 330 pounds, so it is perfect for just about everyone. The NexHT comes with two yoga straps so you can work your upper body while using the machine. The lack of handles makes it easier for you to get creative with your exercises. You can sit or lay on the machine to work your core, glutes, and legs. If you are recovering from an injury or surgery, the NexHT Fitness Vibration Platform is perfect for getting you back on your feet. The vibrations stimulate your circulation and the lympathic drainage system, allowing for quicker healing and reducing any swelling in the body. The platform is also made from ABS material, a high purity rubber that is odorless, skid resistant and extra safe to use. The sturdy and durable platform ensures that even the most unsteady of users will feel comfortable on the machine. A remote comes with each unit so you can adjust the settings without getting off the machine or bending down. There are 99 settings, so you can begin with very light vibrations and work your way to a lot of intensity. The yoga straps that are included are very simple and can be easily used for a variety of upper body workouts. The platform can also double as a step up machine if you want to add in some extra cardio or lower body work when your 10 minutes are up. NexHT Fitness recommends that you only use the machine for 10 minutes a day, but you can go for up to 20 minutes. If you just do the recommended 10 minutes on the machine, you do the equivalent a variety of exercises – a 30 minute swim, 30 minutes of yoga, 300 crunches, or 1 hour of jogging. The NexHT Fitness Vibration Platform is able to do this because of its vibration system. The vibration forces you to work stabilizing muscles that you simply cannot work on solid ground. And since you are building stronger muscles, you will also burn more calories, which will lead to faster weight loss. 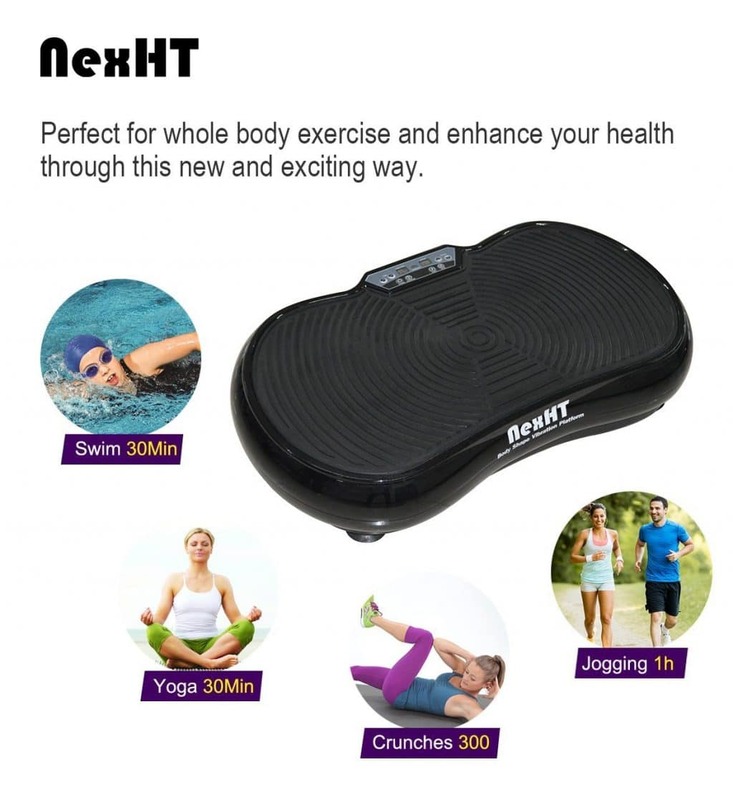 The NexHT Fitness Vibration Platform is a good investment if you are looking to get beach body ready without spending too much money. The simple settings and compact platform make it easy for anyone to use and store. 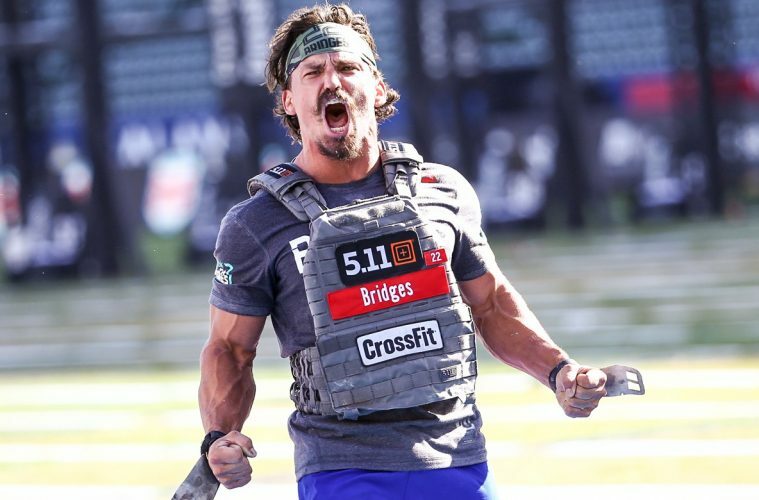 The machine may be really light but can handle an impressive amount of weight. There are 99 different levels of vibration, so there is a comfortable pace for a beginner all the way up to an elite athlete. As an added bonus, the machine comes with a one year warranty! We also like that it is made with new, odorless rubber so your home will not smell like a gym. We’d expect nothing less from environmentally conscious California.